Before looking at the “Dilbert” method, please consider USA Today’s editorial Kavanaugh, too? Christine Blasey Ford’s account is missing key details of assault by Penny Nance. Judge Kavanaugh has vigorously denied Ford’s claim, not just saying this particular incident didn’t happen but that no such incident happened in his entire life. The Senate Judiciary Committee, and the American people, are scheduled to hear from both of them on Monday. Sexual assault is real and claims should not be dismissed. But an innocent man should not be denied all he’s worked for based on allegations from someone who can’t remember key details. 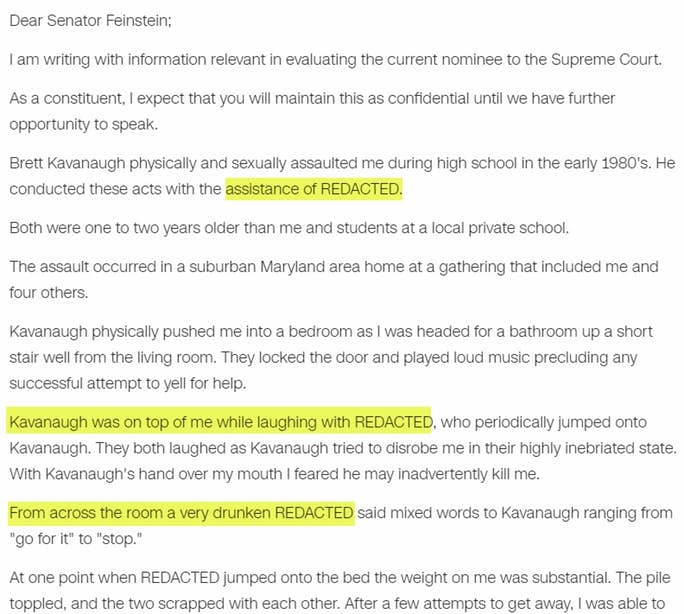 Ford says that Kavanaugh was drunk and that Kavanaugh and one other male, Mark Judge, attacked her. Her therapist’s notes from 2012 say there were four male assailants, but Ms. Ford says that was a mistake. She now says there were two male assailants, but there were four males at the party. Ford says this is an error on the therapist’s part. How many women were at the party? Was this a party of all guys plus Ford? Was Ford herself too drunk to remember? Are we to believe that only the men at the party were drinking? Where the hell are the female witnesses? The Orlando Sentinel discusses instances of mistaken identity in an editorial entitled What if … accuser was assaulted, but Brett Kavanaugh didn’t do it? If he were still alive, one need only ask John Dillinger’s doppelganger, a poor fellow by the name of Ralph Alsman. Dillinger and Alsman shared an incredible physical resemblance, including similar moles next to one eye and matching scars on their left wrists. Thanks to their mirror images, Alsman was arrested 17 times — and shot 11 times! Although he was released after each arrest, he endured repeated interrogations and lived in constant fear that he would eventually be killed. Dillinger was fatally shot on July 22, 1934, ending Alsman’s horror story of the absurd. There not need be a perfect twin, especially if Ford herself had a bit too much to drink. CNN offers this assessment: Christine Blasey Ford, says there was one other person in the room when the alleged incident took place: Kavanaugh’s then-classmate, Mark Judge. Judge, a journalist and filmmaker, has also denied that the incident took place. “It’s just absolutely nuts. I never saw Brett act that way,” Judge told The Weekly Standard in an interview on Friday. Please consider the Letter Christine Blasey Ford Sent to Senator Diane Feinstein accusing Brett Kavanaugh of sexual misconduct. Here is an image clip of a portion of it. Please consider Former Kavanaugh classmate denies knowing about party, being present during alleged sexual assault. A former classmate of Supreme Court nominee Brett Kavanaugh, who was identified as the man in the room during the alleged sexual assault, denies any knowledge of the party in question or any inappropriate conduct by Kavanaugh. Patrick J. Smyth, who was a classmate of Kavanaugh’s at Georgetown Prep, was identified as the friend “PJ” in Ford’s account of the allegations. This story is getting quite messy. Were there three guys in the attack room or two? Four as the therapist’s notes say? Is the claim that Smyth was merely at the party as opposed to being in the room? On October 17, 2016 Dilbert creator Scott Adams wrote an interesting column called Lie Detection and Scandals. Some guilty people will give you a straight denial if they know the question is coming and they prepared for it. For example, Bill Clinton famously said of Monica Lewinsky, “I did not have sexual relations with that woman.” A firm denial from a prepared witness doesn’t mean anything. But a lack of denial, combined with questioning the source, is almost always a lie. Notice that you can’t always tell the difference between an honest answer and a well-coached liar. But the liar without good coaching is as obvious as a lighthouse. When Clinton surrogates redirect any question about Wikileaks to “Russia did it” they are confirming that they believe the content is real and damaging. They just don’t realize they are confirming it. The article predates these charges and hits the nail squarely on the head. In contrast to Ford’s vague memory and confusing details, Kavanaugh issued a very specific denial. He “categorically and unequivocally” denied Ford’s allegations at that time or any time. He claims he attended no such party. Kavanaugh’s specific denial puts him at huge risk if any portion of it was true. Indeed, he is even at huge risk of a lie: someone who claims to have been at the party but wasn’t. Of the three men, Judge was the only person who failed to deny being at such parties. Add it all up and it is overwhelmingly likely that Kavanaugh is totally innocent. From the outset, he made very specific denials as did Smyth more recently. If he was at that party (assuming there was a party), he ran a serious risk of being refuted by someone else who was there. He also ran the risk of being outed in a purposeful lie by someone not at the party, but simply out to get him. There is a miniscule chance that Kavanaugh was prepared. But Clinton, unlike Kavanaugh (knew there was only one other person in the room). Clinton mistakenly presumed she would not yap. It’s hard to believe Kavanaugh would have made that kind of mistake. Unlike Ford supporters, these 65 women actually knew Kavanaugh. Ford is confusing Kavanaugh with someone else, either purposely or accidentally. Reprinted with permission from Mish’s Global Economic Trend Analysis.